(February 14, 2017) – CableMod shook up the world of LED lighting with the release of our Hybrid LED Strips – a lighting solution that features a combination of both RGB and UV LEDs. Today, CableMod expands the Hybrid LED lineup with WideBeam™ Hybrid RGB/W LED Strips. By combining both RGB and dedicated white LEDs on a single strip, users can illuminate their case with a variety of colors, as well as a true, bright white should the mood strike. CableMod WideBeam Hybrid LED Strips combine two different types of LEDs on a single strip. The first type is the same WideBeam RGB LEDs that are featured on our original RGB LED strips. RGB LEDs are great for illuminating a PC chassis in a variety of colors, but when it comes to white, RGB LEDs fire all three color diodes (red, green, and blue) to achieve this. This makes the white color appear slightly off, depending on the viewing angle. This is where the second type of LEDs comes in – dedicated WideBeam white LEDs. With this second LED type in place, users can instead use these LEDs when displaying white, ensuring a true and bright white that can’t be achieved with normal RGB or even RGBW LED bulbs. 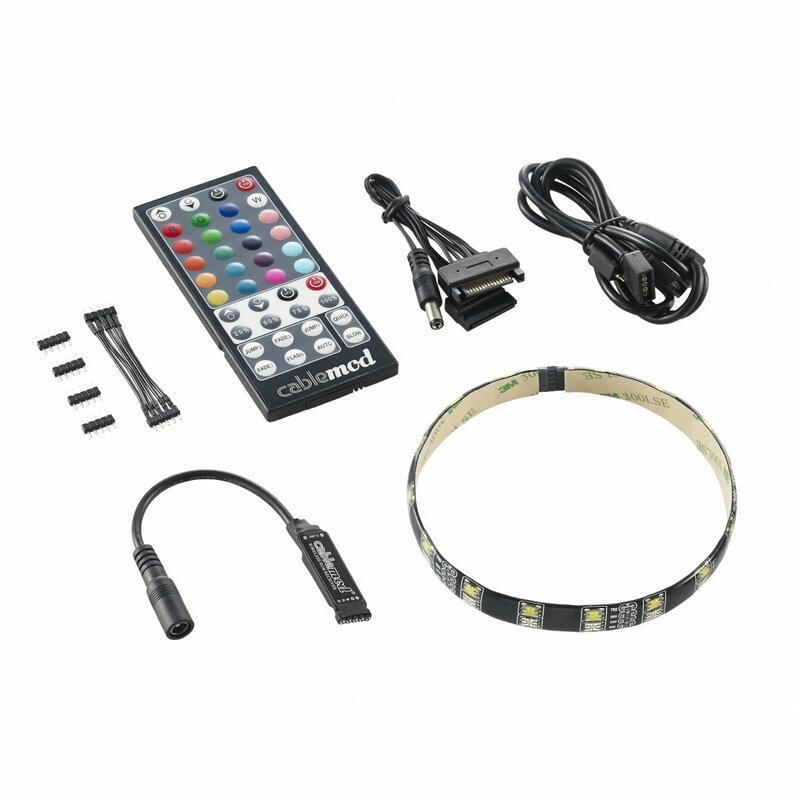 Because Hybrid LED Strips combine two types of LEDs on a single strip, the included 40-key remote control enables users to control both the RGB and white lights independently with a single unit. What’s more, RF technology means that line-of-sight is not required, giving added flexibility for receiver placement. CableMod WideBeam Hybrid RGB/W LED Strips are compatible with GIGABYTE® RGB Fusion Technology, so you can sync up your system’s color scheme right out of the box. Like the RGB/UV version, these Hybrid RGB/W strips combine two types of adhesive. Rare-earth magnets adhere securely to ferrous surfaces like steel PC cases, while allowing easy ad mess-free repositioning at any time. Also along the bottom of each strip is a strong 3M adhesive, making these strips suitable for even non-magnetic surfaces like aluminum. Our WideBeam Hybrid LED Kits also come with a convenient splitter cable that makes routing the strips around your case easier. Like our original LED strips, WideBeam Hybrid LED Strips utilize a modern SATA power connector for a more secure connection, and are also fully chainable when longer lengths are required. WideBeam Hybrid LED Strips will come in full kits featuring two different lengths (30cm and 60cm), as well as single strips. Hi Paul – WideBeam Hybrid LED Strips are not compatible with ASUS AURA because they are 5-pin. ASUS AURA only supports 4-pin RGB strips, like our regular WideBeam RGB. i have a question for you i have a asus motherboard and i am wondering could i use the strip and light up my rig to the sata cable ? Hi Thomas. WideBeam Hybrid LED Strips are not compatible with ASUS AURA because they are 5-pin. ASUS AURA only supports 4-pin RGB strips, like our regular WideBeam RGB. You can of course use the Hybrid LEDs with the included remote control and receiver if you wish. When will this up for sale? Thanks! I’ll keep my eye out for it. 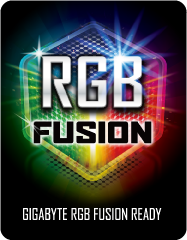 I just purchased a Gigabyte H270 Gaming 3 motherboard and a cablemod RGB/W light strip that is supposed to be GB RBB Fusion compatible to go with it. The motherboard has a male pinout to use with the strip, and I am looking for a female – male adapter so that I don’t have to directly connect the light strip to the MB. Do you offer that cable? the light strip came with a male-male cable for connecting to another light strip, which is great; but I can’t really use the strip if I can’t plug it into that MB connector (it looks terrible if I plug the strip directly into the MB). Thanks for your help. Hi Stephen – the extension cable you are looking for should have been bundled with your motherboard. Can you check your motherboard box to see if it is there? Thanks for responding. Gigabyte told me they do not include the header adapter with the H270 Gaming 3. They directed me to a Phanteks 4-pin header adapter, but it does not appear to be compatible as the Cablemod light strip has 5 pins. Have any suggestions? Exactly which RGB/W light strips are for Gigabyte and which are for Asus or are they the same and compatible with both? This will clear up a lot of confusion . 5 pin for Gigabyte? 4 pin for Asus? That’s what I’m seeing. Hi Pete – Yes, that’s correct! Hi Pete – Our WideBeam RGB LED Strips are compatible with ASUS AURA, while our WideBeam Hybrid LED Strips (both RGB/UV and RGB/W) are compatible with Gigabyte RGB Fusion. This is because the WideBeam RGB LED Strips are 4-pin, while the Hybrid LED Strips are 5-pin. Hope that clears things up! I’m looking for a good rgb strip compatible with msi mystic light (I got a z270 gaming pro carbon motherboard). Will this cable work? other recommendations? Are there adapters that allow these strips to plug into a power bank rather then a motherboard and if so would I get 1 of these adapters in the kit. Hi Joseph – our LEDs were designed for use in a PC chassis, so the only way to power them out of the box is either through your PC’s power supply via SATA power, or with your motherboard’s LED header. We currently don’t offer an adapter for power banks. Are these individually addressable through the RGB Fusion software, or can I only have one solid color at a time? Hi Dylan – our Hybrid LED strips are not addressable, so you can only display one color (plus UV or white) at a time. We will also be releasing addressable LED strips very soon! I have a Gigabyte Aorus xtreme MB. It has 5 pin connectors which plug into your 30 cm Hybrid lights(cm-led-30-d30rgbu-r). My question is about the voltage. The MB can run the LEDs at 5v or 12 v. Which do I use? Hi Steve – you’re going to want to run our hybrid LED strips at 12V. Hope that clears things up!